Featuring a graceful sweeping curve, these Henley benches are a great way of providing plentiful seating without compromising on style. 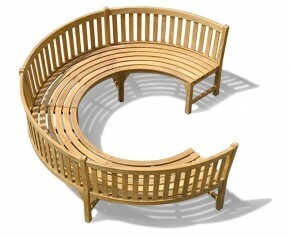 Our semi-circular teak garden benches are uniquely designed and will invigorate your outdoor space. 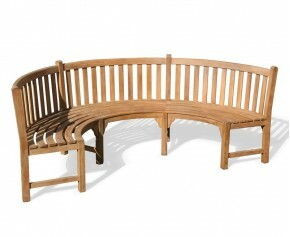 These Henley benches are made with the finest grade-A teak, ensuring extreme durability and guaranteed longevity. 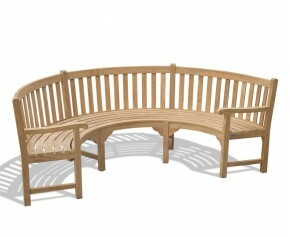 Featuring a sophisticated sweeping curve and a raked back for extra comfort, this beautifully manufactured Henley teak curved wooden bench with arms provides plentiful seating and is the perfect focal point for any outdoor landscape setting. Able to withstand even the harshest of weather conditions, these teak garden benches can remain outdoors all year round with minimal fuss. An elegant addition to other garden furniture, these Henley benches will also look stunning as a focal point of your garden and delight you and your guests.